There are plenty of challenges that pop up whether a client is moving across town or across the seven seas. For a savvy entrepreneur, these challenges are an opportunity to highlight the ways mobile storage containers can ease the burdens of moving. Time moves faster when a client is moving and there is never enough time to get everything done that needs to be done. Mobile storage containers ease the burden by allowing clients to pack and load their possessions when it’s convenient. Furthermore, the container can be delivered when the client is ready to receive it. This is a significant benefit for clients who are waiting for a home to be completed or moving to an area where they haven’t secured permanent housing. 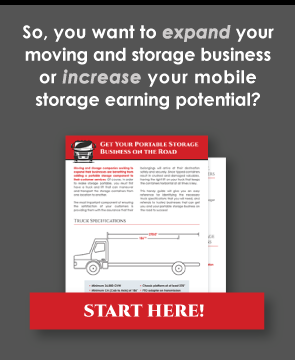 Ultimately, time savings and timing are factors that every mobile storage operator should zero in on within their marketing materials. Clients will most certainly be thinking about both and it’s advisable to prominently insert these benefits within marketing materials. Like Goldilocks wanted the perfect bed, clients want an option that is not too large, and not too small. When a mobile storage operator has containers of various sizes to select from, clients can choose a combination that fits their needs like a glove. This eases many of the challenges that come with moving including packing everything so that items don’t shift and shatter during transport. This is an advantage that operators often overlook but that potential clients are most certainly thinking about. Not many people have a CDL tucked in their wallet and many people are apprehensive about getting behind the wheel of a large moving truck. Mobile storage containers stop this concern in its tracks. The fact that someone else will be doing the driving is a benefit that mobile storage clients genuinely appreciate because it alleviates this very significant concern. Additionally, hiring a mobile storage company makes it easier for most clients to move their vehicles because they don’t have to “ask a friend” to drive their car while they drive the truck. This eases the cost and inconvenience which is something that should be touched on within brochures, flyers, blogs, social media posts, and landing pages. Moving to a new home almost always means moving into a different sized space. This past decade, the trend of “downsizing” has gained considerable momentum that is likely to continue into the future. Moving creates the perfect opportunity for clients to downsize; however, many have trouble taking that step and choose to keep items in storage until they are ready to part with them. Mobile storage allows clients to conveniently set items aside until they are ready to make a decision. Because many potential clients feel “overstuffed,” this is something that should be discussed as a benefit that clients can take advantage of. Real estate agents advise decluttering to make a home feel comfortable and not crowded. This means that clients need to move some, but not all, of their possessions. Marketing mobile storage as a fast and easy way to do this and add value to the home is good sense that makes cents. Mobile storage operators should most certainly sell clients on the return on their investment mobile storage creates. Every move presents challenges and savvy operators see these from the client’s perspective and address each with proactive language and reasoning. Addressing each challenge head-on and with straightforward language is both appreciated and respected.